While I don’t have time to decorate right now (I’m just hoping to get to making some costumes!) I do LOVE October and in honor of this wonderful month and my favorite season (fall) I just had to share one of my all time favorite cakes. It’s from back in the day when I had maybe one blog reader so it won’t be too familiar to you all so I hope you enjoy it. I actually made it for Thanksgiving dinner 2 years ago. If I made it for Halloween I’d make it a Jack O’ Lantern! Wouldn’t that be SO cute! I might just have to do that! This was my first airbrushing ever. It was also an all-nighter for me, but most of my cakes are!! I hand carved the cake, covered it with Orange fondant and then started airbrushing away!!! I was so nervous. But I love love LOVE the end result! I added a green marbled fondant stem and airbrushed it as well. When I showed it to my Uncle the next day he actually grabbed the stem and pulled! AHHHH! He thought it was a ceramic container and that the dessert was inside! We ended up using it as our centerpiece for the meal! This was the first time I used Ganache under fondant instead of buttercream. Changed my life! It’s my favorite way to do it. It holds in the moisture AND it doesn’t squish out all over the place when you put the fondant on. So happy October and early Halloween festivities! Previous Post: « Cupcake tower wedding cake! This cake looks amazing. I can’t believe that it’s a real cake. Beautiful! Thank you! I really love this cake and how well it turned out! Your cake is totally awesome! What talent you have! I love it – are you going to the GNO on Thursday? If so, I will see you there!! Thank you! And I WILL be heading to GNO! I’m SO excited! I’ve never been to The Chocolate, have you? That cake is awesome! I wish I had an airbrush machine – it looks SO good!! Thanks! It’s a really fun toy! I haven’t used it as often as I THOUGHT I would, but I love having it! I cannot believe that is a cake…I kept looking at it! Thanks! I’m not always in love with my cakes, but this one was different! I love love LOVE how well this one turned out! This is amazing! You should send this to Cake Wrecks for their Sunday Sweets feature! Every Sunday they feature amazing beautiful cakes from various decorators & I think this should be included! Thank you! I’d love to be featured there someday! Just as long as I don’t ever end up on a wreck page! Ha! I actually based this cake off a fall/pumpkin wedding cake I saw featured on Sunday Sweets around 3 years ago! That cake is amazing!! I love it. Thanks for linking up to Show and Tell Saturday!! Thanks for hosting! I started hosting my own party because it’s just so much fun to see everyones amazing crafts! that thing is just GORGEOUS!!! Chocolate of course! Does dessert even count if it’s not chocolate? My motto has always been “if it’s not chocolate, what’s the point”. And I have a TO DIE for Chocolate cake. I have great cakes in other flavors, but this one is over the top AMAZING! I guess I could have gone with my pumpkin cake, but since I also made a few pumpkin pies I didn’t think it was neccessary! I also made a few lemon pies, pecan pies, and of course chocolate pies for the gathering! Wow! It looks amazing! I have never done ganache rather than buttercream but it makes Absolute sense! WIll be trying this for upcoming fourth birthday… You should come link this up to my Making It With Allie party! It ends shortly but will be open again later this week. I would love to have you add your projects! They are lovely! Thanks! I love working with Ganache. It’s so much better for under fondant. You put it on and let it dry, then if there is any place that’s no perfect just rub your finger over it. The little heat from your finger melts the bad spot. So it seals in the cake and moister, and it’s a smooth, strong support for fondant. LOVE it! BTW I absolutely LOVE your candy corn dress! Was that all done with a serger? I’ve got to get myself one of those! AMAZING! Oh.My.Word! Girl – that is gorgeous. I can’t believe it is a cake! You are one talented gal! Thank you! I really should have taken a picture once it was cut into to “prove” it! It totally surprised everyone there! Oh, and I love those HUGE black urns by your door! Did you get them like that, or paint them? 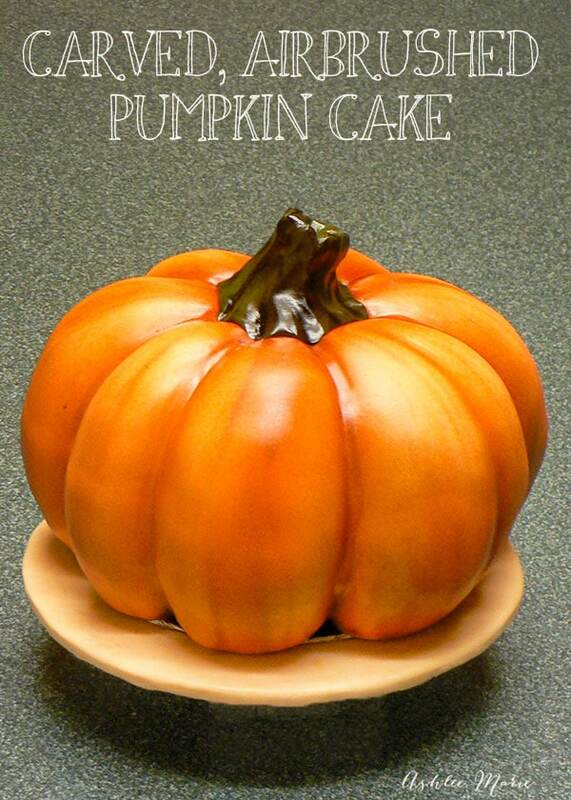 I love the pumpkin cake.. it looks SOOO real.. amazing.. hope you post a tutorial! I’m glad you like it! I actually made it almost 2 years ago for Thanksgiving, WAY before craft blog’s and tutorials had entered my life! I didn’t even think to take pictures of the process. But I just started with an 8 inch round cake 6 inches tall and just started carving away. Then covered it with Ganache then fondant. Then airbrushed it and voila! thanks for the invitation! I linked up! OK….that is a cake!?! SERIOUSLY!? WOW!! That is AWESOME!!! 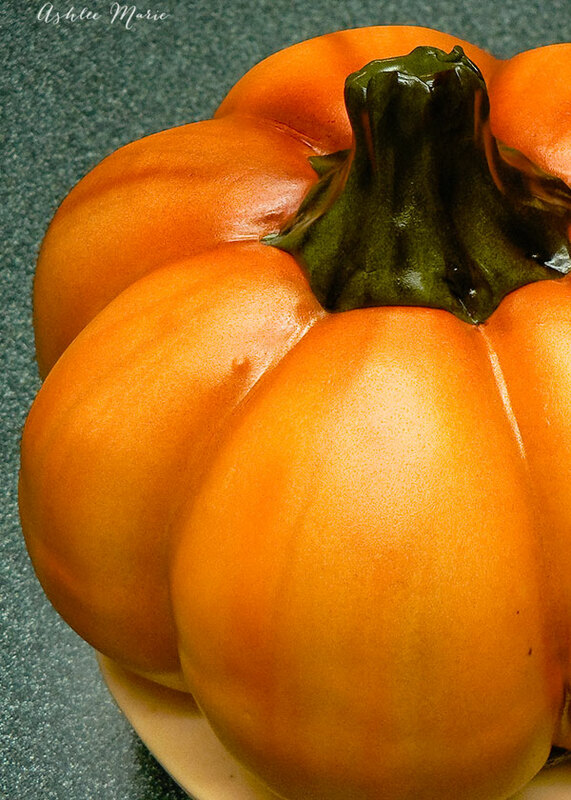 It looks like a ceramic pumpkin you would find at pottery barn!! Oh. Em. Gee. Awesome job girl!!! Thank you! I’ve been meaning to do it again this year, maybe that jack o lantern this time! I thought so! It turned out better than I expected, and it was SUPER tasty too! I really LOVED how it turned out! That is so beautiful! It really doesn’t look like a cake! thanks! I still can’t believe I didn’t take a picture once it was cut! Thank so much! I really enjoy making them. thank you very much! Your pear and dark chocolate crumble looks just DELICIOUS! I am in love with all things dark chocolate! You are TOO sweet! Wouldn’t that be so much fun, to get to make fun cakes ALL the time? And I love your pillows! I hadn’t looked too much into designing my own textiles, but now I’m going to check out the companies you use and look into it! Woman, I simply DEMAND a tutorial! This is so seriously amazing, I honestly thought it was ceramic! I’ll have to make another one, since back when I made this I never considered a tutorial! It’s our pet pig’s birthday this month (on the 31st) though so maybe I’ll be able to throw one together in honor of him! This is crazy good. I wish I was any good at cake decorating. Thanks! Those High top cupcakes look great! They are on my list of things to do soon! I wish I was good a photography so I guess we all have something more we wish we could do! I bet you’d be better than you think at cake decorating, you obviously have a good eye! It definitely fooled me. I thought it was a ceramic piece as well. It is so real looking. You are awesome! I’m tickled every time I hear that! It really was so much fun to create! Okay, I can’t even tell that’s a cake! Amazing!! pottery ,too! This is really well done. If you like you can post a link to this project on my blog. I linked up! Thanks for the invitation! Whoa, i can’t believe that’s a CAKE! Fabulous! Thank you so much! I’m tickled that everyone likes it! Holy Guacamole! It’s just beautiful. You’re so talented. Thanks for sharing your creation. Thank you! Even 2 years later I’m still super pleased with this one! Wow, that is some cake! It is gorgeous! Thanks so much! It was really fun to make! Wow! What an amazing cake! It would almost be painful to cut into that piece of art. But I am sure it tasted oh so good once you did! What an amazing tallent to have, I wish I had the patience! Lucky for me it doesn’t bother me to cut into a cake. But usually people make me do it because they don’t want to! That cake is so pretty. I would have thought it was a figurine too if you hadn’t said it was a cake. Bet you felt sick when your uncle pulled the top off. I can imagine that was funny, but I’d be upset after making something so pretty. Lucky for me (and him) he just tugged on it a little before I screamed a bit and he stopped! It was still soft (hard for fondant to dry out when the chunk is that big and it’s THAT humid) so it pulled a little, but it didn’t pull off all the way. I was able to shape it back easily, no harm done! It was actually flattering! sure I’ll come by and link up! I’m so glad you like it! Thank you so much for linking up with me . Thank for hosting! it’s fun visiting to many other sites and seeing the many crafts that are out there! When I first started my Topsy Turvy Tuesday’s I did just what your doing, going around to other parties and inviting crafters/crafts I liked to come join me. It didn’t take long to branch out! I L O V E it! I’m starting to dabble in modeling chocolate cakes and have one for thanksgiving in the works 😛 Thanks for sharing! oh… What are you working on? I can’t wait to see it! I really need to play with modeling chocolate more! There are just so many possibilities when it comes to cakes! I can not even believe that is a cake. It looks like a glass pumpkin. You did such a great job. Oh my GOSH! I saw the photo and I did a double take. Cake?! It looks like someone mixed the photo up from the post! So I had to check it out and I’m amazed at this cake. No wonder your Uncle thought it was ceramic. The sheen is perfection. Such a beautiful job. Kudos! Thank you very much! I’m just honored that so many people seem to like it as much as I did! I think I’ll have to do a tutorial on it this month! Plus I’ll get to unpack my airbrush gun, win win! Shut UP!!! You’re kidding! This looks like a real pumpkin!! It’s gorgeous! yes WAY! it totally is! And Thank you! I love that it still tricks people! beautiful work! Hope you’ll link up to my DIY Halloween Party & Tutu Giveaway…. Of course I’ll link up, thanks for the invitation. Well I’ve had enough people ask for a tutorial that I think I’ll have to make another one, then I can show the inside too! Freaking amazing. You are the cake master! Thank you so much! I wish every cake turned out as well! This looks WAY too good to eat. I can’t believe that it is a CAKE! Luckily it tastes even better, so it only took me cutting into it for the crowd to dig in! I linked up! Thanks for the invitation! And yes, it really REALLY is a cake! Thanks for the feature! It was such a fun cake to make! I’ve always wanted to do it again, I’m thinking about doing a jack o lantern version as well as a tutorial! OMGness!!! This cake blows me away. It is absolutely PERFECT. Wow 🙂 I’m in love with it. Simply Amazing! I’m so excited I haven’t checked out the rest of your blog yet… have you done any other amazing cakes? I do! I have lots of cakes on here, as well as a cake website http://ashleemariecakes.com/ ! I’m so glad you liked my pumpkin! This blows me away every time I see it. Amazing! Thanks for linking to my halloween party last weekend! Thanks! your so sweet! I’m happy to link up! thanks for doing the same! Thanks! I really really love this cake! I think I’d like to do a multi tiered one next time! Thanks for the feature! I can’t wait to hear more about your vacation! STUNNING! I mean, seriously, this is amazing. Thank you so much! I’m glad you liked it! How did you get into cake decorating? Your cakes look like mine before I took any classes! Your doing a great job! Your frosting is nice and even! Very very hard to learn! If you interested in getting you frosting smoother (without the lines I mean) one way is to take a piece of parchment paper and once the frosting has “crusted” lay it over the frosting and GENTLY slide something flat over the top to push down the “hills”. Another way is to “Iron” the frosting while your putting it on. I take a pair of Lrg frosting spatula’s and lay them in boiling water. Once I get a nice thick coat of frosting on the cake I take out one of the spatula’s, dry it quickly with a towel and take the heated spatula and run it over the cake. The heat of the metal kind of irons down the frosting. But only take one swipe before putting it back in the boiling water and grabbing the other one. I started by taking Wilton Classes. I’d heard good and bad things about them so I went around to the local classes and sat in on a class for each teacher. That way I found the teacher that I liked best, the one I understood and fit my style. She was terrific, with lots of tips and tricks. And soon after I taught at the same place with her! It was a GREAT way to get started! Thank you so much! This is one of my all time favorite still! I would love to see a tutorial on this cake!! It’s awesome! !